URAWA, Saitama Pref. (Kyodo) Archaeologists have found the remains of what is believed to be the oldest man-made structure discovered in Japan  what appears to be a human dwelling in a layer of earth dating back 500,000 years  in Saitama Prefecture. They have also found other stone tools at the digging site, which is deeper than the volcanic layer, they said. 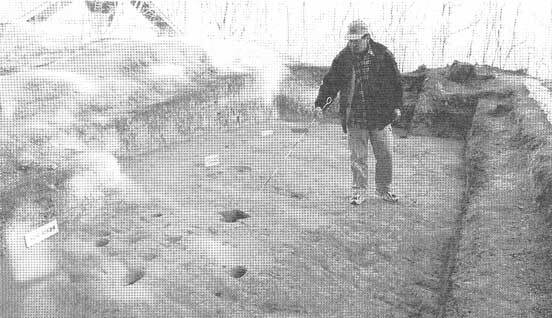 A 50,000-year-old site at Hoshino in Tochigi Prefecture is currently believed to be Japan's oldest. The buildings could have been used as a place to rest, a lookout for hunting, to store hunting tools, or to conduct religious rites, researchers said. Homo erectus likely reached Japan 600,000 years ago at the latest, as 600,000-year-old Paleolithic stone tools were discovered last year at the Kamitakamori site in Miyagi Prefecture. Researchers said the newest finding could represent one of only a few building remains from the Early Paleolithic period, as early humans such as the Peking Man lived in eaves. The remains of pillars and fire pits have been found in France. In two locations about 3 meters apart, five pits were found which showed evidence of pentagon-shaped buildings measuring I meter and 1.5 meters in diameter. Seven stone tools were unearthed at each site, archaeologists said. The pits for the smaller structure were 10 cm in diameter and 15 cm deep, and those for the larger building were 20 cm in diameter. The pits on the southern side of both buildings were farther apart than the other sides. Although no remains of the actual structures were found, the board said the buildings likely had entrances on the southern side, citing structures found in Japan dating between 12,000 and 30,000 years ago. Masao Ambiru, an archaeologist at Meiji University, said the find was a "great discovery presenting clues to the life of primitive man." He said the buildings were likely made from sticks covered with animal skins. The oval-shaped, 5-cm deep place where the stone tools were buried was located between the two building sites. Measuring between 40 cm and 50 cm in diameter, it contained seven small unfinished stone tools, the archaeologists said. Researchers said these tools may have been stored at the site or buried there for religious purposes. The smaller tools were made from stones from outside of eastern Japan. 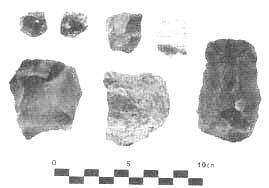 STONE TOOL FRAGMENTS recently unearthed at the Ogasaka dig in Chichibu, Saitama Prefecture, are believed to be 500,000 years old.